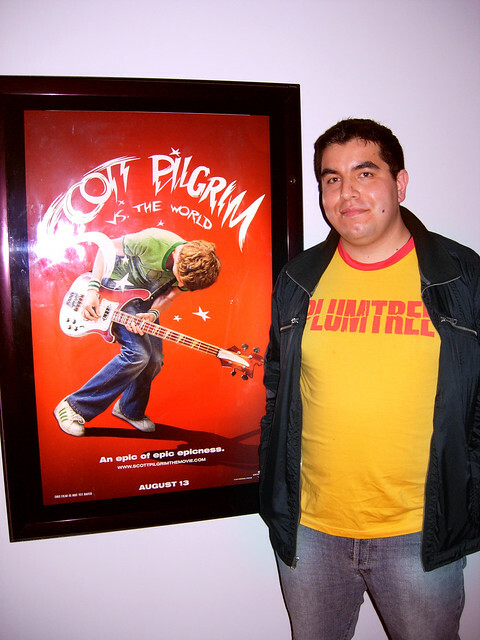 On Friday I ventured to the Metreon to see Scott Pilgrim vs. the World. 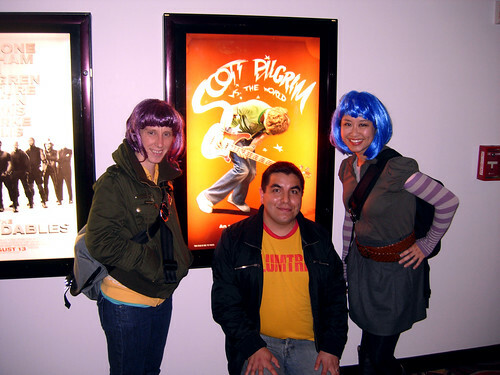 My love for the Scott Pilgrim graphic novels is well documented and I wouldn’t have missed it for all of the world. After the movie I was approached by these two super friendly cosplayers. They asked to have their photo taken with me since I was rocking a Plumtree shirt (that’s Ramona on the left and Knives on the right). So what did I think of it? I really enjoyed myself. It was a movie aimed straight at my teenage sensibilities. I wish all six volumes weren’t compressed into one single film but as a presentation of the entire story I thought it was amazing. I thought Ellen Wong as Knives Chau stole the show. Knives was the only character that really showed some complexity and subtlety in the film and I really appreciated that they made her such a large part of the ending. The resolution of Knives’ story was something the movie did better than the almost perfect and profound book did. I’m going to get some sleep. Tomorrow I have another planned session of Homegirl Purikura with Mayra Ramirez. Pikapika has a new purikura booth and it’s supposed to be really hi-tech. Mayra is bringing another loca to the shoot and I’m exited to see what kind of magic will unfold. 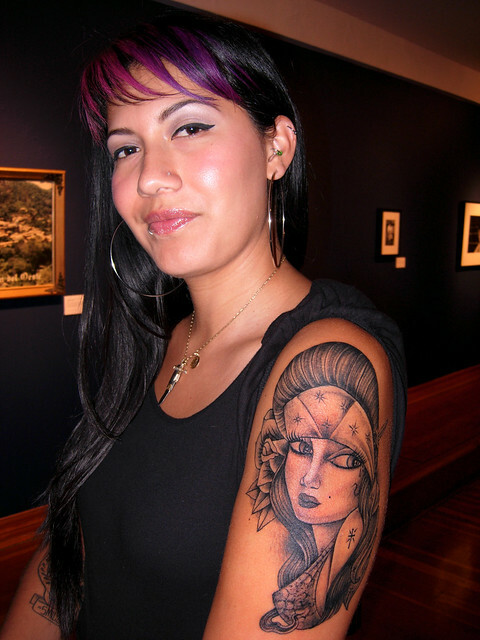 The photoshoot came about because I ran into Mayra the other night at a reception at the Mission Cultural Center. She was sporting a new tattoo that was only about 24 hours old and it was done by the infamous Dr. Lakra. I can’t wait to see how this adds to the visual mix. Stay tuned for the results! Ps. If you want to see a video of me nerding out over Scott Pilgrim Vol. 6 look no further than this report I did for Mission Loc@l.
what a small world. oaxaca +SF def. connected in the artuniverse galaxy. I met dr.lakra’s dad, francisco while living in oaxaca awhile back. making paper +drinking mezcal was epic.